THE United Party for National Development (UPND) should stop causing anarchy and accept defeat in the last general elections, Ugandan President Yoweri Museveni has said. President Museveni advised the UPND leadership against falling into the temptation of destroying the country they were aspiring to govern warning that the opposition party risked taking over a politically destroyed country. The Ugandan President said politics was not the only occupation to help develop the country and that the opposition political parties could contribute to the development of the country through other productive means. President Museveni said this yesterday when he held talks with President Edgar Lungu at State House. The Ugandan leader congratulated President Lungu on his re-election as Republican President in the last general elections. He said the UPND should stop causing trouble and advised the opposition party leadership to be patient and begin planning for the 2021 general elections. “Be patient, stop causing trouble because next time, you may make it. But if you cause trouble, you risk ruling a destroyed country. You can do a lot of things including business because politics is not the end of the world,” President Museveni said. He explained that political leaders in Zambia should emulate first president Kenneth Kaunda who stood by other nations and helped them in the liberation struggle in Southern Africa and expressed happiness that the founding father of the nation was being looked after well. President Museveni said some African leaders were not happy with some of the leaders who did not treat Dr Kaunda well and saluted President Lungu for looking after Dr Kaunda well. 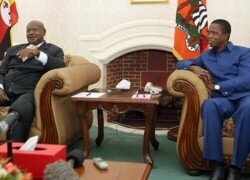 And President Museveni said he was happy to be invited to grace Zambia’s 52nd independence anniversary. He said Zambia had tremendously grown economically and hoped that the country was going to continue on its economic trajectory under President Lungu. President Museveni said he would during his visit to Zambia discuss the economy, stating that Zambia and Uganda had enormous potential to develop economic co-operating. “Zambia is vast but its population is small and the country is growing. We are going to discuss the economic potential and I thank President Lungu for inviting me. What you young people call history, I call current affairs because I recall the days of Independence and the liberation struggle. I thank God for giving me long life to see Zambia born, she is 52 years old. I am happy to be home,” President Museveni said. And President Lungu thanked President Museveni for honouring the invitation to grace the Independence anniversary, stating that it was befitting for a senior statesman like the Ugandan President to celebrate and officiate at the country’s 52nd Independence anniversary. “We thank you for coming for this important occasion. We are 52 and it is befitting that a senior statesman is here to celebrate with us,” President Lungu said. President Lungu later hosted his Ugandan counterpart and his entourage for dinner which was also attended by former president Rupiah Banda, Vice President Inonge Wina, Minister of Justice Given Lubinda, Minister of Finance Felix Mutati and Patriotic Front deputy secretary general Mumbi Phiri.